Ingjard is a Nord warrior found in Fort Dawnguard. Like most other recruits, she is available as a follower, and with Hearthfire installed, she is available as your personal steward. She arrives at Fort Dawnguard when you reach stage 60 of the quest Prophet. She will then join the growing team of recruits hanging out in the western area and will spend her time wandering, relaxing, eating or using the various tools in the area. On every full hour, she may decide to train her crossbow skills on the dummies in the northern cave for three hours. She sleeps on one of the cots between 8pm and 4am. During the Kindred Judgment quest, she will be in the crowd when Isran holds his speech, although she will not participate in the attack on Volkihar Keep. She is clad in a set of Dawnguard equipment. This includes the cuirass as well as matching pairs of gauntlets and boots. 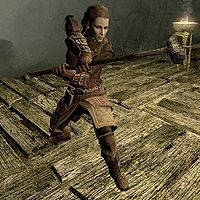 She is equipped with a Dawnguard warhammer and a crossbow supplemented with fifteen steel bolts. She carries random leveled bandit loot, and has a 25% chance of carrying 1-9 gold. When speaking to her, she will mention your accomplishments and offers to aid you, "I hear you're doing a lot of the work in tracking down these vampires. If there's anything I can do to help, let me know." You can also ask her how she joined the Dawnguard, to which she will explain, "Something bad happens, word spreads. More bad things happen, people worry. The more they worry, the more they talk about it. I've been hearing rumors for a bit now. I was glad to find out not only the bad rumors were true." This page was last modified on 23 August 2018, at 23:44.